The gears of justice keep on turning. 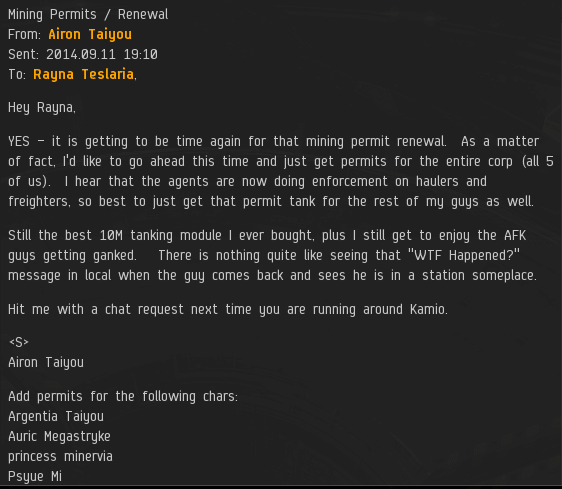 No matter how much isk we spend on ganking ships, the people of highsec send us more. Give us the tools and we'll do the job. Colonel Falkenberg has come a long way. With his purchase of 750 additional shares, he sent us over the 412 billion mark and earned a Supreme Protector's Tip of the Hat™. Side note: Colonel referenced the permabans of certain Agents. Some of you have been waiting to hear what I will say on this matter. Don't worry, you'll get your fill of words--and then some. Stick around. Big G Chelien's purchase of 500 shares put us over the 413 billion mark and earned him a Supreme Protector's Tip of the Hat™. Big G also purchased some shares for Kalynn Shardani. A thoughtful gift! 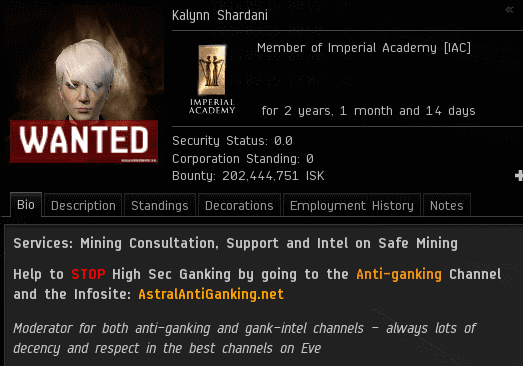 I still love the fact that there's someone out there who advertises her services as a highsec mining "consultant". Maria Malukker has earned a name for herself lately as the haiku master. The New Order has warrior poets! Maria's purchase of 315 additional shares sent us over the 414 billion mark and earned her a Supreme Protector's Tip of the Hat™. I love that haiku. 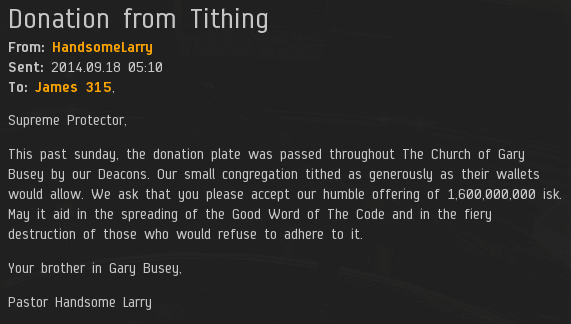 The Church of Gary Busey proves there are still people who put their isk where their mouth is. With a purchase of 1,600 shares, we're now over the 415 and 416 billion marks. Excellent! The Church of Gary Busey receives a Double Supreme Protector's Tip of the Hat™. I always love to see good things happening in highsec. Speaking of which, it's a magical time of year when summer turns to fall. Check your calendars, permit owners! Is your year almost up? Yes, Airon Taiyou was the very first miner to put a "bumper sticker" in his bio. He invented the loyalty pledge for miners nearly two years ago. Today, thousands of miners have followed in Airon's footsteps. 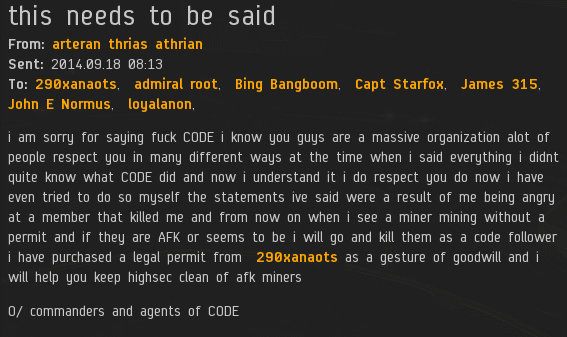 Even a highsec miner can leave a big impact on EVE--if he follows the Code. Keep the faith, keep the Code, keep on rockin' and rollin'. This is what we do. "The day I won EvE!" 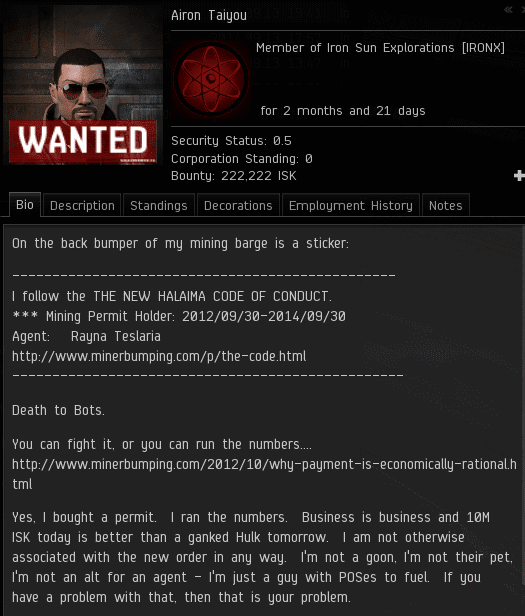 Still scamming noobs with mining permits huh? You do know that since CODEdot has been declared a terrorist organization by CONCORD's Beaur of Enforcing Antagonist Retribution division (ore B.E.A.R for short) under the authority of the Concord Antagonist Retribution Enforcement act (ore C.A.R.E for short). The faction police are charged by their empires to enforce the C.A.R.E. act against anyone on the B.E.A.R. list. CODEdot is on be B.E.A.R. list so donating ISK to them is a violation of the law. Violation of the law can result in the revocation of pilot's license, confiscation and/or decommissioning of the violator's ship by the faction police, or even CONCORD. A person who is not affiliated with either CONCORD or faction police can also decommission the violator's pod and clone. So, a word to the wise. Don't support CODEdot and run afoul of the C.A.R.E act and get placed on the B.E.A.R list. So much faith! Time to match it with some mighty works! My team is going to double our efforts! 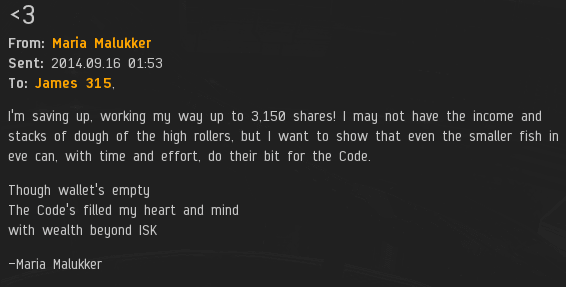 All the glory be to the Savior of HighSec, James 315! 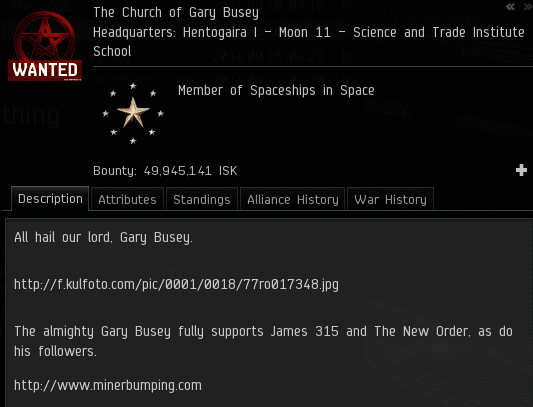 Butthurt Miner AKA James 315 is just another role player we don't need in Eve. Failed attempt to make anti-CODE community to look bad. I see what you did there. And maybe one day, Beers will realize that without the Code, his "emergent gameplay" would not exist. Embrace the Code Beers ! soo i have been wondering since there is so much cry about mechanics and such, All permit holder should honour the Knights and Agents of the order by podding them on sight. Since they are at that point criminal the emergent gameplay demands that the pods are blow up aswhel for the CODE. Yet your "laws" claim that any harm towards an agent and/or knight is wrong. SAVE THE CODE FROM ITSELF KILL AL SUSPECT AGENTS AND KNIGHTS. There is nothing *to* say. butchered, but best i could do. quiet = peaceful, low word = whisper. jimu is James, not gym. haiku is generally accepted as three lines of poetry consisting of 5, 7, and 5 syllables (in english-speaking terms) thus Maria's confusion at your post. why not try your hand at it? helps to know the rules. I NEVER KNEW MY DAD. **** MY MOM, SHE THREW ME OUT OF THE HOUSE BEFORE I WAS EVEN 13. THEN SHE HAS THE GALL TO TRY AND KEEP IN TOUCH WITH ME AFTER THAT. GRANTED MY LIFE LIVING WITH HER WAS ****TY TOO. I HAD ONE FRIEND GROWING UP, THE ONLY OTHER KID IN TOWN. MY ENTIRE CHILDHOOD WITH HIM WAS SPENT GETTING THE **** KICKED OUT OF MYSELF AND THEN LISTENING TO HIM TELL ME HOW WORTHLESS I WAS. NOT LIKE I HAD A CHOICE THOUGH, THERE WAS ONLY NINE ****ING PEOPLE IN THE TOWN. I **** YOU NOT. SO I DIDN'T MISS THE PLACE, BUT AFTER LEAVING I SPENT MY ENTIRE ADOLESCENCE WANDERING THE COUNTRY FROM TOWN TO TOWN. MY ONLY FRIEND AT THE TIME WAS AN ASIAN GUY IN HIS MID-THIRTIES WHO ONLY HUNG AROUND WITH ME SINCE HE THOUGHT I'D GET HIM LAID. WHEN I FIRST MET THE GUY WE GOT IN A HUGE BRAWL AND HE ALMOST KILLED MY PET, A TINY RODENT I CARRIED WITH ME. ONLY AFTER I BEAT HIM DID HE WANT TO HAVE ANYTHING TO DO WITH ME. THERE WAS A PERK THOUGH, THIS CUTE RED HEADED GIRL THAT STARTED HANGING AROUND. SHE WAS SOME KIND OF A SADIST THOUGH, SHE LIKED TO BEAT ME UP AND TALK ABOUT WATER AND ****. I THINK SHE WAS A LITTLE CRAZY, BUT HEY, AREN'T WE ALL? WELL SOME OF US ARE A LITTLE LOONY, BUT THE BANE OF MY ****ING EXISTENCE WAS THIS LOONY AS **** ADULT COUPLE. THEY WHERE ONE OF THOSE KINDS THAT DRESSES ALIKE AND FINISHES EACH OTHERS SENTENCES. THEN THEY HAD THIS CRAZY CAT WITH THEM TOO, THE ****ING THING WOULD NOT SHUT UP. LET ALONE THE ****ING THING ALWAYS TRIED TO LIKE STEAL MY PET RAT AND EAT IT. DAMN THING NEEDED A GOOD BOOT TO THE FACE. I GOT TO SEE A LOT OF CRAZY PLACES, WHICH WAS NICE, BUT IT WAS AN EPISODE AFTER EPISODE TO GET ANYWHERE. SO MY LIFE WAS ****ING WEIRD, I SPENT THE TIME TRAVELING FROM TOWN TO TOWN GETTING IN FIGHTS WITH KIDS AND ADULTS. THE ONLY THING THAT KEPT ME GOING WAS MY DREAM TO BECOME A POKEMAN MASTER.